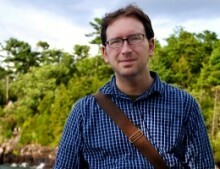 Welcome to the Lightspeed Book Review column! Every month as I work toward figuring out which books I’m going to review here, I start off with an overly ambitious list that’s whittled down by the number of pages left, divided by the time I have available, but in that rush, I find that the books that I end up with tend to come down to a similar theme. That’s the case this month with two books that I read recently: Paolo Bacigalupi’s forthcoming novel The Water Knife, and Edan Lepucki’s powerful debut, California. In this month’s column, we’ve ended up with two books that look at the collapse of society in very different ways. Edan Lepucki came to the literary world’s attention through the efforts of one Stephen Colbert last year, at the height of the Hachette-Amazon struggle. It’s a good thing, too. 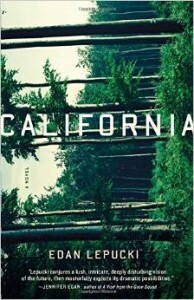 Lepucki’s fantastic debut novel, California, takes stock of a number of post-apocalyptic tropes and packages them through the eyes of its lead characters, Frida and California. These two figures are eking out a living in the midst of the California wilderness, somewhere outside of Los Angeles. Prior to this, society had been engaged in a slow collapse: prices were rising, people were out of work, and society was coalescing into exclusive communities in which a select few could enjoy food, work and security. Everyone else has been forced to live in any way that they can: Frida and California live off the land, growing their own food and preserving what little they have from their former lives. Everything changes when they discover that they’re not too far from the Land, a social collective of others who make their way under none other than Frida’s brother, Micah, who had been presumed killed in a suicide bombing. Lepucki deftly uses this book as an examination of class, and the efforts people will go to in order to uphold and maintain a system of wealth and privilege for those who enjoy it, while others work to undermine and change the system for those shut out of the system. California is really an examination of the concept of sacrifice in the face of the greater good. On their own, Frida and Cal have to contend with their own issues, but once they’re brought to the Land, they’re forced to navigate a complex set of internal politics from a group that has become hardened in order to survive. They’ve given up their children, fought off attacks from pirates, all as they labor to ensure that they, as a community, can survive. Frida and Cal learn more about Micah and his intentions with the Land; it’s clear that there’s more to his motivations than just playing by the rules: his eventual goals include long-term revolution to disrupt the existence of the communities. Lepucki takes this further — the exclusive communities have their own agendas, and much of what Frida and Cal experience and observe turns out to be an even more elaborate set of manipulations: the pirates and scattered nature of some of the settlers is far more organized than at first glance, designed to keep the gated communities safer by ensuring that no groups can threaten their existence. When we finally see the inside of one of these communities, they’re a parable of the 1950s lifestyle, where everyone has a house and family, but with an added amount of security and surveillance to ensure that everyone in the settlement is playing by the rules. California takes on a personal look at what the end of the world might mean for people, and makes a good case for what people might hold on to when they’ve lost just about everything around them. 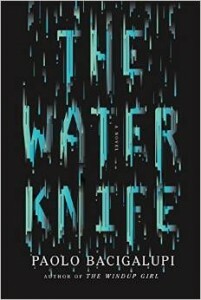 On the other side of the post-apocalyptic spectrum, Paolo Bacigalupi’s long-awaited adult novel (as opposed to the three excellent YA novels he’s released since 2009’s The Windup Girl) The Water Knife is an exercise in a different sort of end of the world story. Like last year’s The Doubt Factory, his latest carries with it a ripped-from-the-headlines feel as dwindling water supplies in the American Southwest force various cities and organizations into conflict with one another. It’s a desperate fight for survival in the middle of a desert, and the winners will come away with the one thing that’s needed to survive: water. At some point in the very near future, major cities such as Phoenix and Las Vegas find themselves with an influx of capital from Chinese investors, who begin to construct major arcologies to house their local populations. The habitats are a pinnacle of desert survival: water is plentiful and captured, their citizens maintain opulent and secure apartments, and they’re able to select out the undesirable individuals who can cause problems. To help maintain Las Vegas’s hold on their water supplies, Catherine Case hires out people such as Angel Velasquez, a Water Knife, to help keep her habitats secure, whether that means helping to secure legal documents and persons of interest, or occasionally breaking legs. When a fellow journalist is murdered in Phoenix, Angel meets Lucy Monroe, a journalist covering the slow decline of the city, and the potentially game-changing set of legal documents that can change everything for the city on its way out. Finally, a young Texan refugee, Maria Villarosa, finds herself in the mix when she comes between powerful interests that will stop at nothing to get what they need. The three come together in a violent and desperate clash as the southwest comes apart. In many ways, The Water Knife is Bacigalupi’s follow-up to his landmark debut, The Windup Girl. It follows a very similar structure, mixing discrete, personal stories against larger corporate and faceless interests, showcasing a fantastic portrait of a declining civilization. Bacigalupi’s works frequently feel all too real, and there’s an uncomfortable quality to The Water Knife, a feeling that his future is one that we’ll probably come up against at some point in the not-too-distant-future. Already, the American West is gripped in the midst of a major drought: viral pictures of reservoirs, news footage of major forest fires, and bans on watering lawns all capture our attention. In many ways, this novel shows that in spite of it all, life continues on: small groups of people will collect in the cracks, clinging on and learning to thrive in their environments, despite the hardships. While an excellent example of the climate fiction genre, Bacigalupi looks beyond environmental hardship with this novel: wealth inequality is a major focus as the country dries up. As resources become harder to come by, those who can afford to hold onto the remaining supplies of water do everything in their power to hold on to every last drop, using money to buy out stores, lawyers when that doesn’t work, and men with guns when all else fails. The arcologies of Las Vegas and Phoenix do more than just hold people comfortably in the scorching desert: they’re a symbol of what wealth can buy: life, where it shouldn’t exist. Everyone else is left to fight over the scraps on the outskirts. The Water Knife is a fine follow-up and companion to The Windup Girl, one that takes a good, hard look at how we use resources and people when we can’t afford to, and the lengths which we’ll go to hold onto what we’ve got when we run short. Together, both novels examine a comparable topic, the collapse of civilization, and both have some overlap in how societies die. Lepucki puts together some fantastic descriptions of her gated communities, imagery that is hard to shake away. These are entire micro-states governed by strong private interests that welcome a very select few. Likewise, The Water Knife presents much the same picture: major business interests erect monuments to wealth, all while leaving the poor, immigrants, and others out to die in the outskirts. Both Bacigalupi and Lepucki seem to agree that when pushed to the edge, people will rally around what is familiar, and will push away anything or anyone deemed to be a threat. It’s stark commentary for today’s world, and both books serve as an excellent mirror for the world we could very well head toward. What both authors don’t seem to agree upon is how people will react to this. Lepucki’s Frida and Cal seem willing to accept whatever they need to do in order to survive with their child. Lucy Monroe, on the other hand, is willing to undermine the entire structure and push for radical change when the opportunity is presented to her, although not all of her companions seem willing to make such sacrifices. In either case, however, reality for their characters is grim, and each of their personal struggles exacts a major toll, threatening their well-being and the lives of those around them. While both books have their flaws and drawbacks, each serves as an outstanding speculative work — not because they deal with the collapse of civilization or the typical post-apocalyptic tropes, but because they explicitly deal with characters confronting revolutionary changes in their everyday lives, changes brought on by the failings of the present day.